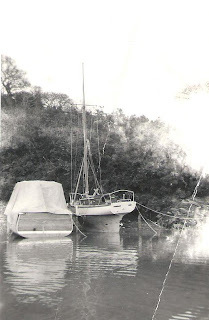 'Wanderer' after her mast was stepped. ‘Wanderer’ was a Hillyard 2 ½ ton sloop built in 1934 at the famous Littlehampton yard where hundreds of boats were crafted over the years, even until early in 2009 when fire devastated the building shed. I bought her in early March, 1972 from a boatyard on the Percuil River that flows into the River Fal in Cornwall. My first task was to step the mast which I did single-handed by using the boom and the whisker pole. I lashed them together to make a temporary crane with the mainsheet and blocks. If you look carefully at the black and white photograph you will see the arrangement still in place after the shrouds had been set up. I was amazed how easy it could be done, but one thing I was not so sure about was servicing the Stuart Turner petrol engine. Really, the procedure was a matter of commonsense, because the engine was not a complicated piece of machinery. If there was a spark when the engine was cranked and the carburettor was clean, all should have worked. Nevertheless, I did have difficulty, because unknown to me, there was dirt in the fuel tank that in time lodged in the carburettor. 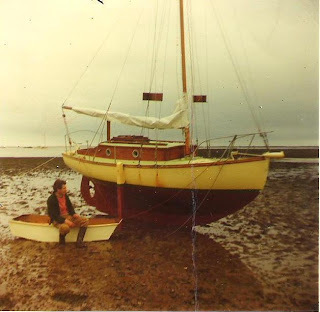 After preparing the yacht for a passage to Starcross where I had laid a mooring, I set off on 31st March, 1972. Aboard were two friends, Geoff and Chas. Chas had looked over the boat at my request when I first saw a ‘For Sale’ advertisement giving her details. The weather was bright and the wind was a force 4 from the northwest, which was ideal for an up-Channel sail. Chas had brought his yacht tender with him, so that he could leave ship at St. Mawes. There his wife would meet him with their car. I was glad to have Chas aboard at the outset, because he was an experienced sailor. Geoff had volunteered to be my crew for the entire passage to Starcross. With the engine puttering along we made sail, but a half a mile from the Yard, the engine failed. Chas took immediate action, and in two jiffs he had the carburettor and the supply pipe cleaned and reassembled. At the first pull of the handle, the engine sprang into life. A half-an-hour later, as planned, Chas climbed into his dinghy and rowed to St. Mawes quay where his wife greeted him. At 1350 St. Anthony’s Lighthouse was abeam to port, about three cables. We estimated ‘Wanderer’s’ speed at 4 knots, and set the yacht on a heading of 098 degrees. By 1600 the impressive Dodman Point was due north. Three-and-a-half hours later, with the wind and tide helping us along, our observed position placed us one-and-a-half miles southwest of the Eddystone Lighthouse. Altogether we had sailed a distance of twenty-nine miles from St. Anthony’s Point, at an average speed of just over 4.8 knots. Unaccountably at that time, I lost the logbook, and the remainder of the account was written from memory on the 2nd April, 1972. As the night wore on, the wind speed increased to force 6 and visibility on account of fog decreased to 400 yards. This was verified by the inshore shipping forecast. We twice reefed the mainsail, until handing it completely; then we exchanged the working jib for the storm jib. While reefing the mainsail I lost the topping lift and because I had not tied a figure of eight knot in the tail of the main halyard I temporarily let it fly in the wind. By bringing the boat head to wind, even with the storm jib set, I was able to grab the tail of the halyard. All this was done in darkness on the deck while our ship was tossed by the waves. Rain didn’t help. We were utterly miserable and a little apprehensive. We took turns at helming the boat for one hour at time. We fed ourselves by munching raisins and nuts and drinking hot soup. From our portable radio we heard the tragic news of a Belgium trawler that had gone aground off Bolt Head! (We had no VHF radio.) ‘Wanderer’ would have been two or three miles to the south when the grounding happened, but we saw no lights or distress signals. Later that night I took three consecutive DF bearings of Start Point which confirmed we were making slow progress to the south of it. Morning sunrise revealed that ‘Wanderer’ had been pushed by the ebb tide to the southeast of our intended track. By then the seas were more manageable, and as we ate Weetabix for breakfast, a large, three-mast schooner overhauled us. The wind remained from the southwest, but lessened until it was about force 2. Life was uncomfortable because of the lumpy sea, so there was only one thing for it: make full sail! We broad-reached past the entrance to the Dart and the craggy Mewstone; then we continued around Berry Head into Torbay. There the wind veered to the north. All the tossing and turning of the boat during the gale had churned up rubbish in the fuel tank, so that the engine failed to start. Geoff copied Chas’s example by clearing the fuel pipe, but instead of blowing through it with his mouth he made use of the inflatable dinghy’s foot pump to force air through. Early evening saw us struggling against the ebb as we followed the channel into the River Exe. The sandy beach of Exmouth seafront was to our starboard hand, and to port were the Pole Sands, but with the engine faltering we had our doubts that we would make it. However, Lady Luck was on our side, because we were able to grab a vacant mooring south of Exmouth Dock. There we took a rest while we prepared and ate dinner. Again the fuel pipe needed attention, before we could proceed to ‘Wanderer’s’ mooring which was not far from the ferry jetty at Starcross. Until the very end, the recalcitrant engine played tricks with us. After picking up the mooring, we were too exhausted to tidy the boat. We just secured the sails, locked the cabin, inflated the dinghy and rowed ashore for phoning Geoff’s wife. We asked her to collect us in her car. When she arrived, I felt sorry for her, because we looked like tramps and smelt like skunks! But ‘Wanderer’ was mine, on my own mooring, and I was truly grateful to Geoff and his wife for their help. P.S. I forgot to mention that during the night, the pushpit had been bent by the force of a wave as it crashed into the windbreak, at the same time tearing the canvas. I guess the wind had reached force 8 at the height of the gale.